Dissolution process is a complex phenomenon controlled by several factors as like lithology, porosity, stress orientation, environmental conditions and networks of fractures. Then, fault zone and fractures play an important role in fluid circulation and in dissolution, acting as barriers or conduits. In fact, the fault zone has a high permeability only in the early stages of the movement, but shortly the process of recrystallization and reprecipitation reduces the permeability greatly within them. Despite this, traditionally (Cucchi and Forti in In Att. e Mem. Comm. Grotte “E: Boegan” 87–93, 1988; Bini et al. 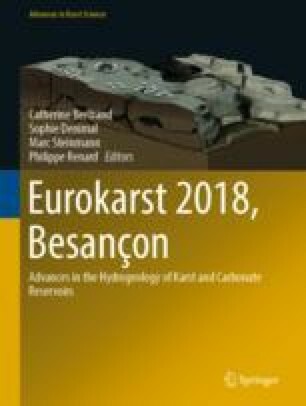 in Varese Lake and the Quaternary 6:3–14, 1993; Ferrarese and Meneghel in Aspetti dell’influenza strutturale sulla morfogenesi carsica del Montello (Treviso), 45–59, 1992), the dissolution is associated with extensional structures such as faults and joints believing that they are more favorable to the water circulation. In this context, compressional tectonic structures, as like stylolites, are never been taken into consideration. In fact, the stylolites play an important role in the fluid circulation (Alsharhan and Sadd in U.A.E., Society for Sedimentary Geology Special Publicatio, 185–207 2000; Raynaud in J Struct Geol, 973–980, 1992) and in particular in the incipit of dissolution and then of the karst. The focus of the research is to investigate the starting point of the dissolution and the micromechanisms that act in the fluid/rock system. To achieve this, we performed: field work, labs analysis. The field work was carried out in a karst area in the South Italy (Alte Murge). Through a detailed structural analysis in the field and using the method of Caine (Caine et al. in Geology 1025–1028, 1996), we reconstructed the permeability of the fault zone. Our attention was focused on faults, joints and stylolites. To support the field observations we had carried out, chemical and petrographic analysis (XRD, FTIR, SEM), that are helping us to characterize the porosity and permeability near these structures. Recently, fluid/rock interactions and their impact on carbonate rocks are becoming very important as a consequence of a progressive deterioration of the quantity and quality of the groundwater due to increasing pollution phenomena. In fact, the aquifers represent about 40% of the drinking water resources and their importance will increase in coming years. I want to thank my Supervisor, Prof. Cees Passchier, for his support and helpful advices and, in addition, thank Dr. Mark Peternell for his collaboration on this research. Very helpful and interesting were the discussions with Prof. Piotr Szymczak (University of Warsaw) that helped me to focus better on the still unclear aspect of dissolution. I also want to thank Prof. Francois Renard (University of Grenoble) for interesting discussions and his availability to give me very helpful advices.